1 ^ Danish, Low German, Sorbian, Romany and Frisian are officially recognised by the ECRML. 2 ^ Before 2002: Deutsche Mark (DEM). 3 ^ Also .eu, shared with European Union member states. 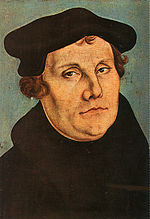 Martin Luther initiated the Protestant Reformation. Foundation of modern Germany in Versailles, France, १८७१. Bismarck is at the centre in a white uniform. ↑ Max Mangold (ed. ), सं (1995) (Germanमा). Duden, Aussprachewörterbuch (Duden Pronunciation Dictionary) (6th ed. संस्करण). Mannheim: Dudenverlag (Bibliographisches Institut & F.A. Brockhaus AG. pp. 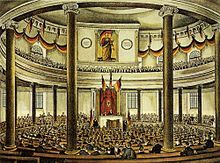 pp 271, 53f. .
↑ Federal Constitutional Court of Germany (2 BvF 1/73; BVerfGE 36, 1) : The German Reich as the German state is identically the very same to the Federal Republic of Germany [because it exists as a nation-state and international legal personality (public international law) since 1871]. 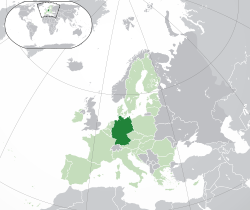 In 1949, at East – West Germany division there was no foundation of a new West German state and no successor of the German Reich, instead of that a part of Germany was reorganized.